written by Sadam Hussain Memon on March 26, 2019, 2:50 p.m.
Nice taste, Value for money! written by Maroof Ali on Feb. 7, 2019, 3:53 p.m. Taste is Good but menu is too short as well lack of deals, there is no any family deals or promotion. Promotion and deal high appreciated! written by Adil Malik on Jan. 26, 2019, 11:49 a.m.
written by Bilal Maqsood on Jan. 2, 2019, 4:07 p.m.
quality is not up to th e mark tasteless biryani don't waste money to try this. it was good in past but not now...i would never order again. written by qadeer sheikh on Nov. 6, 2018, 2:10 p.m.
written by Fahad Siddiqui on Oct. 26, 2018, 12:08 p.m.
written by Usman Suhail on Oct. 15, 2018, 1:46 p.m.
written by Ali Raza on Sept. 26, 2018, 3:54 p.m.
it was good experience with waqas birynai. i tried this 1st time and will try it again. i also request cheetay to introduce more offers. written by Abdul Wahab on Sept. 12, 2018, 1:26 p.m.
Bad experience this time, I ordered 32 biryanis and waited for around 3 hours to get the meal, rider was not picking up the calls, that was frustrating time, I paid amount first otherwise I did not accept the order too much late. written by Muhammad Saleem on Aug. 16, 2018, 4:24 p.m.
written by Anas Ijaz on Aug. 8, 2018, 11:45 p.m.
written by Adil Malik on July 14, 2018, 12:41 p.m.
written by Nouman Tuheed Khan on June 7, 2018, 1:38 a.m. Awesome Food! More than enough, Best quality and outstanding order delivery plus tracking. written by Rizwan Shakir on Feb. 28, 2018, 3:18 p.m. I like its quality and quantity. If you have low budget and want good quality food then Waqas Biryani should be on top. written by Ahmad Nauman on Feb. 27, 2018, 11:07 a.m.
written by Zeshan M. on Feb. 20, 2018, 9:31 p.m.
written by Fawad Siddiqui on Feb. 19, 2018, 4:53 p.m.
written by Uneeb Aslam on Feb. 17, 2018, 10:53 a.m.
written by Nazia Mukhtar on Jan. 18, 2018, 1:12 p.m.
written by Tallal Hassan on Jan. 4, 2018, 6:57 p.m.
written by Ali Rajab Raza on Dec. 30, 2017, 12:16 p.m. Perfect taste with quality and quantity and above all of it was super hot. written by Humaira Tayyab on Dec. 28, 2017, 4:06 p.m.
written by Usman Abdul Majeed on Dec. 5, 2017, 12:35 p.m.
Best biryani... our emergency treat..
written by Athar Parvaiz on Nov. 17, 2017, 12:40 p.m.
written by Hamza Zia on Nov. 11, 2017, 2:37 p.m.
awsome taste. very good service. written by khurram khalid on Nov. 10, 2017, 4:41 p.m.
very tasty biryani. Good quality raita and salad. We ordered 5 full biryani for 7 people. written by Muhammad Hassan Riaz Yousufi on Nov. 6, 2017, 2:54 p.m. This is a fact of life. No, wait, scratch that. This is a fact of desi life, that everyone loves biryani. (Although, many goras who have tried biryani also love it, so…) Have you ever wondered what makes biryani so special? Even uttering the word and thinking about it makes you salivate. You start imagining the last time you had a steaming hot plate of biryani. The spicy aroma putting you in a trance and taking you in a land where there is just happiness. 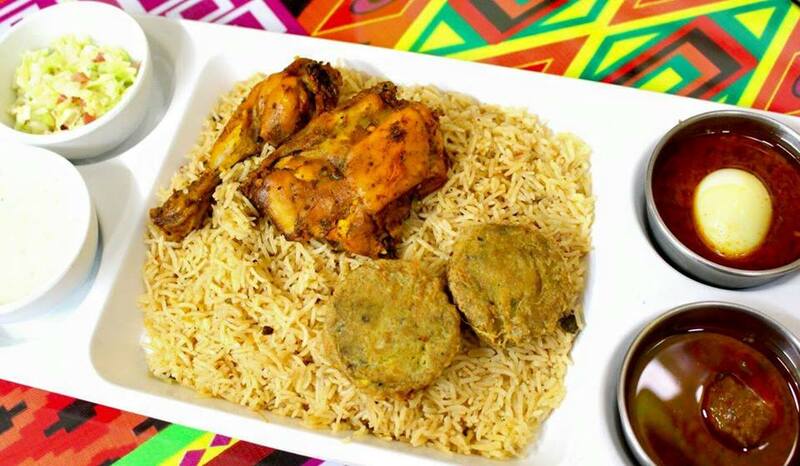 The perfectly tender boti smothered in an aromatic blend of spices that make your mouth water. Have you tried the best biryani in Lahore? If you haven’t, then you are in luck because like always, we got yo’ back! Introducing you to the best possible restaurants is what we strive for. So in order to get your hands on the ‘Best Biryani‘ in town, try Waqas biryani. And we promise you will fall in love with biryani all over again! We know for sure that their rendition of a spicy and authentic biryani made with a blend of special herbs and spices will renew your love for what is universally adored by all. The vibrant yellow colour of the rice, the lusciously tender chicken pieces tossed in the buoyant rice infused with an aromatic masala will tantalise your taste buds. This is one of those places that you will keep talking about for a long long time. You will get anyone and everyone you know to try Waqas biryani. That’s how amazing it is. The biryani can be ordered in two serving sizes, the large and the small plate. Both the plates have ample quantity so it’s a great value for your money. The level of spiciness is also on point. So there is just a teensy weensy problem. See Waqas biryani is located on hall road. And due to massive customer demand, there is a large crowd of people gathered to get their hands on a sizzling plate. So you can imagine the hassle involved in trying to get a coveted plate of their biryani. This does not mean that you can’t get it. OR that you have to go through all this trouble to eat biryani. If you are not willing to brave the traffic with roads littered with cars, motor bikes and cycles loitering around, then it is okay. It is way more easy to just have your food delivered at your house. Our Cheetah’s will battle through all the insane traffic, go all the way to hall road, wait in line for that perfect biryani, and bring it back to you at your doorstep, that too hot and fresh. All you have to do now is grab your phone, download the Cheetay app and order away! Or, just visit Cheetay’s website and get one step closer to eating the best biryani in town. You’re welcome.